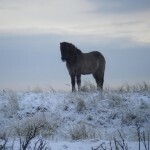 Stal Edda offers the unique opportunity to get to know the Icelandic horse with his comfortable tölt. Icelandic horses are friendly, social, and willing animals directly descended from the European primeval horse. Because of the import ban on Iceland around the year 1100, this breed has remained pure and kept its special gaits, Tölt and Pace. The Icelandic Horse is a small, compact, and strong horse, and with a height between 1.30m and 1.45m, they can easily carry adults. 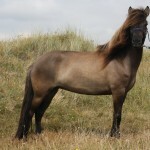 Furthermore, the Icelandic horse is characterized by its wild mane, and in winter, by a nice warm and wooly coat. All colours occur: black till fox, wild till fur and even silver dapple. The tölt is a very comfortable gait, for the footfall pattern is similar to that of walk, which means there is always at least one foot on the ground. This prevents the lifting of the rider out of the saddle which makes a trot or pace more uncomfortable. Therefore in tölt the rider can easily sit still in the saddle. This makes long rides in tölt on the Vlieland beach very comfortable and relaxing. Tölt can be ridden in different speeds, from just a little faster than walk to almost canter tempo. Pace is a lateral movement in which the horse moves two legs of one side simultaneously, followed by the pair of legs on the other side. For camels and giraffes, this way of walking is normal and also some horse breeds can do it, including the Icelandic horse. A slow variant of the pace is called Piggy Pace and it is not desired. At competitions, pace is ridden on a long straight track and very high speeds can be achieved.